Looking for the easiest fudge recipe? Today’s Easy Rocky Road Fudge is your answer. And it’s absolutely delicious too! Making fudge at home doesn’t have to be difficult. With just a few ingredients and tips for how to make chocolate fudge, you are only steps away from a decadent dessert. Growing up we didn’t call this Rocky Road. Any dessert that had chocolate, nuts and marshmallow was called Heavenly Hash. Am I the only one that remember Heavenly Hash ice cream? I’m not THAT old, so surely someone else out there might recall this chunky ice cream. At birthday parties, we always had several ice cream flavors to choose from. Neapolitan and Heavenly Hash were almost always present. The third flavor was usually the wild card…ranging from Chocolate Mint to Caramel Fudge swirl, depending on the desires of the birthday child. To me it didn’t matter, I always wanted the Heavenly Hash. Then one day, everything changed. Heavenly Hash became Rocky Road. Still tasted great, so I’m not complaining. I think the name ‘hash’ just brought on too many connotations maybe? Last year I made some Heavenly Hash brownies. OMG you guys, the comments on my facebook page were crazy….I guess ‘hash and brownies’ was a total name fail. I should have called them Rocky Road brownies! Anyways, on to this Easy Rocky Road fudge. It is super easy, no stovetop needed (I used the microwave for the melting)! Today’s recipe was the very first fudge I ever made as an adult. Why it’s taken me so long to share it here with all you fanatics, is beyond me. But don’t worry, the wait is over! You are only 5 ingredients away from having some of this chilling in your fridge! And my son has declared this recipe his favorite fudge I’ve ever made. He loves all fudge too, so this is a big win in my book. Especially since it’s probably one of the easiest fudge recipes you’ll ever make! ENJOY! Line an 8-inch square baking dish with parchment paper. Pour 1 cup marshmallows into bottom of dish. In a large microwave safe bowl, combine semi sweet and milk chocolate with peanut butter. Microwave for 30 seconds, stir and add an additional 30 seconds. Continue stirring until smooth (you may need to microwave an additional 30-60 seconds). Mine took about 60 seconds total. Fold in remaining 1 1/2 cup mini marshmallows and peanuts. Pour chocolate mixture over marshmallows in baking dish. Refrigerate until firm, several hours. Cut into bite sized pieces and enjoy. Q: I don’t have a microwave, can Rocky Road Fudge be made on the stovetop? A: Yes! I would use a double boiler to melt the chocolate (or a glass bowl over a pot of simmering/boiling water). Melt your chocolate and peanut butter together, until smooth. Q: We’re allergic to peanuts, are there substitutions? Q: Can Rocky Road Fudge be frozen? A: Definitely! Wrap the fudge tightly in plastic wrap or wax paper. Then wrap in foil and place in an airtight container or freezer safe ziploc bag. You can store for 3 months in the freezer. When ready to use, thaw at room temperature, still wrapped. ENJOY! First up, these Rocky Road Clusters. Change up the way you make today’s recipe, and serve it in fun little clusters. Perfect for bake sales! You’ll love the delicious flavor combination in this sweet Cranberry Orange Fudge recipe! Perfect for Mother’s Day! When it comes to fudge, Cookies and Cream Fudge should always top the list. Packed with Oreos and flavor, you can’t resist this classic treat! Learn how to make Homemade Milky Ways from Back for Seconds with just 5 ingredients! 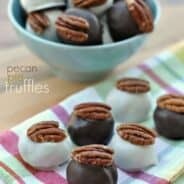 These are so easy to make, and they taste just like the original! These delicious Homemade Caramel Cups from Spend with Pennies are not only totally decadent, they’re actually easy to make! 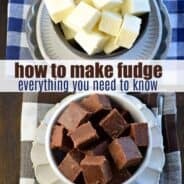 Looking for the easiest fudge recipe? Today's Easy Rocky Road Fudge is your answer. And it's absolutely delicious too! In a large microwave safe bowl, combine the chocolates and peanut butter. Microwave for 30 seconds, stir and add an additional 30 seconds. Continue stirring until smooth (you may need to microwave an additional 30-60 seconds). 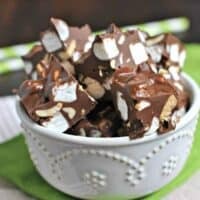 This recipe for Easy Rocky Road Fudge was originally published on Shugary Sweets on December 16, 2014 and has been updated and republished in May 2018. I bet people were pretty disappointed when they heard what you meant by “hash.” But not me! I’d rather have rocky road any day than…you know. And this fudge is amazing! No milk in it, either! The peanut butter is a stroke of genius. I actually have never heard rocky road called heavenly hash…does that make me super young? Please say yes because the wrinkles are saying otherwise 🙂 Or just send me a package of fudge…yeah, do that instead because it looks super amazing. I love puffy marshmallows in creamy fudge! I’ve never heard of heavenly hash ice cream and I think I’m older than you, lol. I guess I was hiding under a bush through out my childhood. This fudge looks wonderful. If I lived near by I would be knocking on your door right now. Does that make me sound creepy? I just want some fudge! Pinned! Wonder if only certain stores carried it? Anyways, thanks for pinning 🙂 And no, not creepy at all! Oh, man! I am the biggest fan of rocky road! 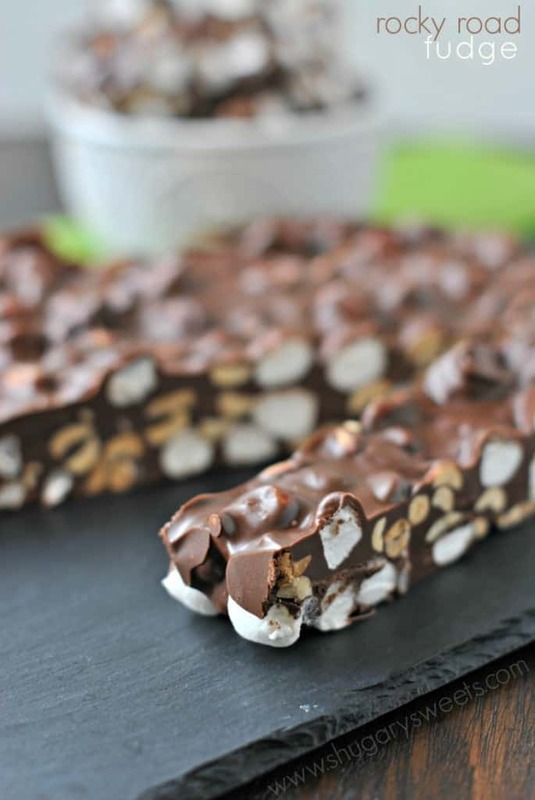 and Rocky road fudge….Yes! 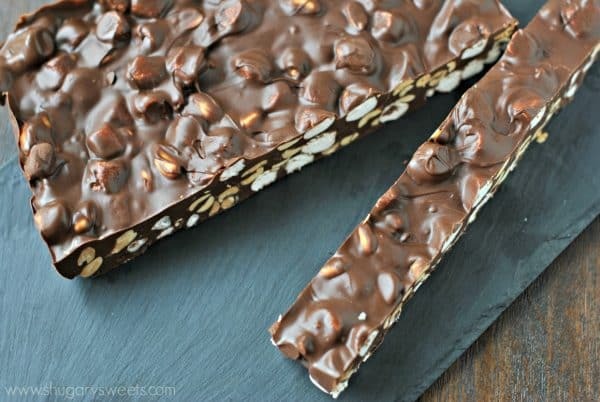 rocky road is THE BEST and this fudge is daaaangerously easy! I grew up with it being called both. Either way it’s called it is insanely good and makes you keep reaching for more! Yep, it does have almonds 🙂 I put that in the recipe. My son prefers the salted peanuts though (which is good because I always have them on hand)! I’ll make this during the holidays. Thanks for the recipe! Yum! That looks delicious! I am a serious chocolate fan – I have to try this! This would make a great gift for Christmas time. Thanks for sharing. Lovely, easy recipe to take the edge off my chocolate cravings! This is a fantastic fudge recipe! Delicious! And who doesn’t love rocky road!! 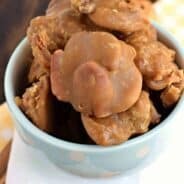 I had trouble getting into the food fanatic website to get this recipe. Was wishing you would have just posted the recipe here. Anyway, after many tries, finally got the recipe and it was worth it. Everyone loved the fudge. It got eaten all up and it was really easy to make. Easy and Yummy are a win win in my book. Sorry for your troubles, but so glad you enjoyed the recipe! All I can say is “YUM”. This stuff looks good. Made a similar without the rocks using coconut oil as the shortening but it had evaporate milk in it for the creaminess. Is this hard or a fudge like consistency? Thank you for your service, and happy to hear you enjoyed the fudge! I made the Rocky Road fudge for our family Christmas Eve party. It was a big hit! And get this! My fussiest child, my adult son, was the one that said, “what is that candy mom?” That is so good! Can you substitute the peanut butter for something else? For anyone with peanut allergies? You could use Biscoff (speculoos) spread! -That dish looks very attractive. I will proceed to do it now! This is the fudge to end all fudges!! So so so good! We can’t get enough. My family looks forward to this fudge every year. It’s a favorite at our house. I so remember Heavenly Hash ice cream! And I’m not so old either. lol This fudge looks delicious. I’ve made one similar but love the idea of marshmallows on the bottom. And so easy. It will be the perfect addition to my Christmas tins. I don’t care what you call it……I’ll call it delicious!! I loveeeee making this during Christmas! It’s so good! I don’t care if it’s called Heavenly Hash or Rocky Road, I’ll still eat it! I love the ice cream, and the fudge looks incredible. Adding it to my list of recipes to make for neighbors this year. This is the BEST fudge ever! 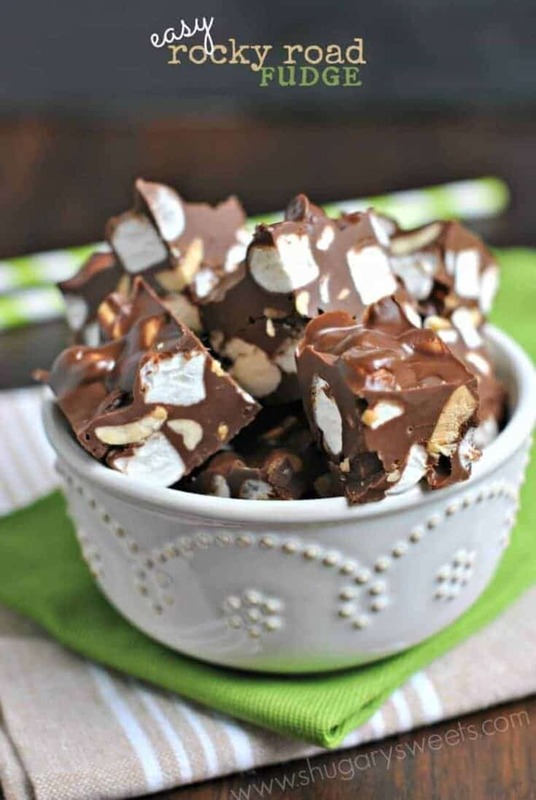 So easy to make and who doesn’t love Rocky Road?! I love the soft marshmallows added to this fudge. It didn’t last very long in our house!! !